Autodesk is launching a new suite of products designed to bring point-cloud scanning data into building information models with greater precision and clarity. Chief among them is a new product called ReCap, which is designed to incorporate 3D point-cloud technology into BIM with greater ease. Autodesk® ReCap delivers powerful and easy to use workflow on the desktop and in the cloud to create intelligent 3D models from laser scans and captured photos. Rather than beginning with a blank sheet, Autodesk ReCap now enables any designer, architect or engineer to add, modify, validate and document their design process in context from existing environments. The San Rafael, Calif.-based company says ReCap works with traditional design-based desktop software as well as cloud-based applications to create intelligent 3D models from laser scans and captured photos. “If you don’t have a laser scanner, you can use your [camera] phone,” said Brian Mathews, vice president of reality capture for Autodesk, during a recent demonstration of the software, viewable on YouTube. A big trend in engineering design today, he notes, is that design teams “want to go beyond working with ‘dumb’ 3D points to getting their data to work with their CAD model.” With the proliferation of ever-smarter devices for data capture and prices dropping for scanning technology, reality capture of point data for design and modeling is becoming more widely used in design and modeling work. But making the data work smarter in the design itself is a key goal for design teams, Mathews adds. ReCap is geared to “visualize, clean and organize” reality-capture data, he says.Expected to be available by April 12th, ReCap is part of Autodesk’s rebranded software portfolio update for 2014. 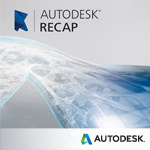 In addition to ReCap, the suite of updated products for design and engineering sectors includes Autodesk ReCap Photo, which helps users create high-resolution, textured 3D models from photos. Using cloud servers, ReCap Photo can then upload and distribute the models to mobile work groups, the company says. The latest product refresh works in hand with many apps and suites already in use, such as its mobile app released last fall called 123DApp (available for free download). The app also helps users capture real objects with photos and then use that photo data to generate 3D models or create parts to print and assemble into 3D objects.For Amar Hanspal, Autodesk’s senior vice president of information modeling, the big news is ReCap, which helps teams maintain consistent data across a BIM’s life cycle. “It’s a true reflection of how we have evolved as a company,” he says. This entry was posted in BIM Software and tagged Autodesk, point cloud on April 3, 2013 by rumbelom.